With Rumsfeld Under Fire New Questions Emerge About His Role in Prisoner Torture | Democracy Now! President Bush held the 17th press conference of his presidency Monday, a day before he headed out to Camp David and Crawford ranch for the holidays. At the hour-long news conference, Bush strongly defended Defense Secretary Donald Rumsfeld’s handling of the Iraq war, admitted serious problems in training Iraqi forces, and laid out his second-term domestic agenda. Today, we are going to be looking at a number of the issues raised at Bush’s end-of-the-year news conference including his plan for Social Security, the White House policy on torture, and Donald Rumsfeld. Since claiming victory in the 2004 presidential election, President Bush has moved swiftly in his unprecedented reshuffling of his cabinet. And the process has certainly not been without its share of controversy. Bush’s nominee to replace Tom Ridge at the Department of Homeland Security, Former New York City Police Commissioner Bernard Kerik, went down amid widespread allegations of corruption, possible tax fraud, mafia connections, misuse of property and a litany of other concerns. In a moment we are going to look at his nominee for Attorney General, Alberto Gonzales, and the issue of the administration’s use of torture. But first, we turn to one of the officials who is remaining at his current post—Defense Secretary Donald Rumsfeld. There is a brewing debate in Washington, particularly within the ranks of the Republican Party, over Bush’s decision to keep Rumsfeld on for a second term. Prominent Republican Senators like Trent Lott and John McCain have both publicly questioned Bush’s decision to keep him. That controversy gained new fuel this week when Rumsfeld admitted he had not personally signed letters to families of soldiers killed in Iraq or Afghanistan, relying instead on a rubber-stamp machine. On Monday, President Bush defended Rumsfeld at a White House Press conference. President Bush, news conference, December 20, 2004. Joe Conason, author of the best-selling book “Big Lies: The Right-Wing Propaganda Machine and How it Distorts the Truth.” He is the editor-at-large at The New York Observer. He writes a column for Salon.com. His latest piece is called “Torture Begins at the Top,” about a recently disclosed FBI memo that indicates that “marching orders” to abandon traditional interrogation methods came directly from Defense Secretary Donald Rumsfeld. AMY GOODMAN: On Monday, President Bush defended Rumsfeld at a White House news conference. REPORTER: You talked about the big picture elements of the secretary’s job, but did you find it offensive that he didn’t take the time to personally sign condolence letters to the families of troops killed in Iraq. And if so, why is that an offense that you are willing to overlook? GEORGE W. BUSH: Listen, uh, I know how — I know Secretary Rumsfeld’s heart. I know how much he cares for the troops. He and his wife go out to Walter Reed and Bethesda all the time to provide comfort and solace. I have seen the anguish in his — heard the anguish in his voice and seen his eyes when we talk about the danger in Iraq and the fact that youngsters are over there in harm’s way. He is a good, decent man. He’s a caring fellow. Sometimes perhaps his demeanor is rough and gruff, but beneath the rough and gruff, no nonsense demeanor is a good human being who cares deeply about the military and deeply about the grief that war causes. AMY GOODMAN: President Bush at his news conference on Monday. We turn now to Joe Conason who wrote a piece this week at Salon.com called “Torture Begins at the Top.” A recently disclosed F.B.I. memo indicates that marching orders to abandon traditional interrogation methods came from Defense Secretary Donald Rumsfeld himself, says Joe Conason, who joins us on the phone. Welcome to Democracy Now! JOE CONASON: Good morning, Amy. AMY GOODMAN: It’s good to have you with us. Can you tell us further what you understand about this F.B.I. memo? JOE CONASON: Well, this memo is an internal email within the F.B.I. from be a unnamed F.B.I. special agent to one of the supervisors of F.B.I. counter-terror activities, and specifically of F.B.I. agents who were conducting interrogations in Guantanamo. The memo explains — the memo was written around the time that — of the exposure of the Abu Ghraib prison abuse scandal. So the memo is trying to explain what’s called walk back the cat in intelligence lingo, go back and look at what had happened. As the F.B.I. and the Pentagon and other defense — other intelligence agencies considered how to handle the prisoners who were coming out of Afghanistan, how to interrogate them, what the best methods were. What it says is that the F.B.I. argued strongly against abusive techniques in Guantanamo, and argued with two ranking generals, General Dunlavey and General Geoffrey Miller who figured largely in the Abu Ghraib scandal because he went to Iraq after setting up the system at Guantanamo, and that the response of the military was, of these generals was, you can try your methods, but we have our marching orders from the SecDef, which is what the memo says and the SecDef is military jargon for the Secretary of Defense. In other words, this is an acknowledgement by the F.B.I. in the internal memo that the military was behaving towards these prisoners in a manner that had been ordered by Donald Rumsfeld’s office. That the allegations of abuse and in some cases torture had grown out of an attitude that ordinary conventions and international law did not have to be observed in the treatment of these prisoners. 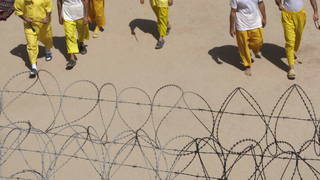 AMY GOODMAN: We’re talking to Joe Conason his piece is called “Torture Begins at the Top.” What about the ACLU documents that indicate that the interrogators at Guantanamo dressed as or identified themselves as F.B.I. to throw people off, that they were actually from the Pentagon, to deflect criticism of the Pentagon. JOE CONASON: Well, that’s a very interesting — that’s news today. I didn’t know about that when I wrote this story. These documents — there are now hundreds and thousands of documents that the ACLU, the American Civil Liberties Union, has pried loose from various agencies that have been involved in the interrogating of prisoners, including the Defense Intelligence Agency, the F.B.I., the Pentagon, the C.I.A., and there’s quite a bit of news to be found in all of these documents. That’s kind of the latest thing, which appears on the front page of The New York Times today. The Times has actually been doing a pretty good job of digging out these documents and going through them, although it was funny that I found this reference to the SecDef, and that had not appeared yet in the Times at that point. To me, that’s the smoking gun, because the question is how high up did this mandate for abuse go? We know that the White House counsel, Alberto Gonzales, who you said you were going to talk about later, and people in his office, played a role in trying to create a legal rationale for this, but now we know that the Secretary of Defense, at least according to the F.B.I.’s own documents, also played a role in encouraging much, much more aggressive and possibly abusive, I think abusive, treatment of these prisoners. AMY GOODMAN: Just at the — right around the time you have just put out this piece, your other piece, “Rumsfeld the Bungler.” Seven months before the Defense Secretary’s recent exchange, another grunt had complained about inadequate armor. Very briefly, summarize that. JOE CONASON: That story showed that according to the Pentagon’s own transcripts, the Secretary of Defense had been asked at a town hall meeting in Baghdad back in May when he made a sort of a very brief visit to Iraq. He had been asked publicly about the lack of armor for military vehicles there by another soldier. He had allowed General Myers, the chairman of the joint chiefs of staff, who was with him at the time, to answer, and basically they said, well, we’re going to get you all of the armor you need. Seven months later, we had the same question come up again because they had not done it. AMY GOODMAN: Joe Conason, thanks for being with us. AMY GOODMAN: Joe Conason of salon.com. His book is called, Big Lies: The Right Wing Propaganda Machine and How It Distorts the Truth.